← It’s Summertime and the Living is . . . Sweaty! Hello! It’s been too long since I posted. The Summer was a busy one, and now I’m a little overwhelmed with everything I want to share with you guys. I couldn’t resist telling you about an item I just bought today at Whole Foods in Hillcrest. A man was handing out spoons with a dab of honey on them, so I couldn’t resist. His flyer claims that this is “The World’s Best Tasting Honey”. Again, how could I turn a taste down? I just wish my in-laws were here because they love honey. When they visit, we usually stop at Julian to pick up a few jars and a pie, of course. My Whole Foods plan was to buy Sencha Tea, and I came out with tea, a container of olives (couldn’t resist that either) and an amazing honey. 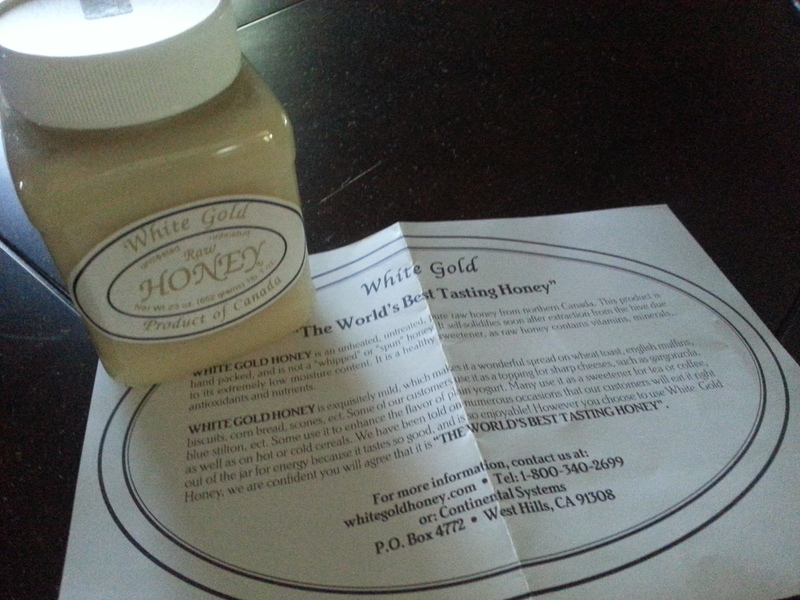 White Gold is from northern Canada (www.whitegoldhoney.com) . It is unheated and untreated. It is thick, creamy and has a perfect touch of sweetness. You can use it like any regular honey, but considering how thick and delicious this is, I think I would prefer it on a scone or with some delicious cheese (preferably from Venissimo! http://www.venissimo.com/). It is about $13 for 1 pound 7 ounces. Whenever I go grocery shopping, I have my list and coupons in hand. I rarely, if ever, deviate from my list. This shopping excursion made me realize I should slow down and take a look at some other products. I love how Whole Foods really searches for those smaller companies who are just so passionate about whatever it is they are creating and selling. I can’t wait to share some more awesome food spots I checked out over the Summer! Any let me know about any food spots or products you discovered over the Summer! Can’t wait to try it…if I’m worthy.